You’ve saved your whole career, your kids are launched, and perhaps your mortgage is paid off. Now you’re starting to feel like it’s time to begin thinking more seriously about the next chapter in your life. As financial advisors, we believe it’s important to build a relationship with each individual and couple by asking questions from the beginning, which can lead to thoughtful and insightful conversations surrounding their desires for the future. By working together as a team, we’re able to do in-depth planning and financial modeling so that our clients feel knowledgeable and empowered about their financial decisions, both pre- and post-retirement. The number one question we receive is, “Do I have enough money saved to retire comfortably?” Unfortunately, there’s no magic bullet in answering this question and it ultimately depends how much you’re living on, what extras are desired in retirement, how healthy you are and how long you want your money to last. As a general rule of thumb in today’s financial planning industry, an initial withdrawal rate of 4 to 5 percent from your investment accounts (adjusted annually for inflation), is generally believed to be sustainable over a 25 to 30 year retirement timeline. Does 4 to 5 percent mean the same to each of us? Absolutely not, and keep reading to see the reasons why. Consider the type of investment account(s) you’ve been accumulating and building up over time. Have your contributions been directed mainly to 401k and 403b plans? Have you been making contributions into a non-qualified account? Did you elect to pay taxes up-front and make hefty contributions into Roth IRAs or the Roth portion of your company’s retirement plan? The answer to these questions will help determine how far your retirement nest egg will take you throughout your golden years. Contributions over your lifetime to a 401K, 403B and IRA are considered pre-tax additions. This means you saved on taxes during the years contributions were made and the future value of these accounts will be considered ordinary taxable income in the years distributions are taken. This can result in a hefty tax bill if the bulk of your assets are located within this type of account structure, particularly if you find yourself in a high tax bracket in retirement. For distributions that occur before age 59½, there is generally a 10 percent early withdrawal penalty that also applies (although there may be some exceptions). Contributions over your lifetime to a Roth IRA are made with after-tax dollars. As long as the Roth IRA was established at least 5 years before distributions are taken AND the account owner is over age 59½, distributions (including earnings) are completely tax-free. If the account owner initiates distributions on the growth portion of the account before age 59½, these distributions are taxed as ordinary income plus a 10% early withdrawal penalty (again there may be some exceptions). For account owners that are not yet 59½ years old, distributions of previously made contributions (e.g. principal) can be taken tax and penalty free. Contributions to non-qualified accounts over your lifetime are made with after-tax dollars and you’ve been paying tax on the investment income on an annual basis as dividends, interest and capital gains, which are all considered income for tax purposes. Qualified dividends and long-term capital gains are generally eligible for more favorable tax rates (e.g. 0, 15, or 20 percent) depending on your overall taxable income. 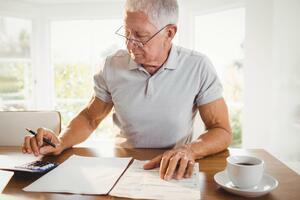 When determining whether or not you have the adequate resources available to support you in your retirement years, you must take into account not only your investment balances, but also the type of account(s) in which your assets are invested. Most people think of diversification from the standpoint of how much they have invested in stocks versus bonds. We encourage going one step further and thinking of diversification from a tax standpoint. Adequate diversification from both an investment and tax standpoint can potentially add longevity to a financial plan and long-term distribution strategy.